I came into the practice of yoga and meditation over 15 years ago following a health condition that forced me to slow down. This transformative experience inspired me to delve deeper with a commitment to the practice and teachings ever since. In addition to my background as a yoga instructor, I am a licensed clinical psychologist with an interest in integrating contemplative practices with Western Psychology. Through my work with mind/body practices for trauma, depression, and anxiety, I have come to recognize the healing power of yoga and meditation in everyday lives. 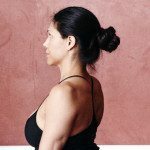 I believe in empowering and supporting individuals in using their practice to embrace their uniqueness, and to cultivate love and compassion both on and off the mat. I teach a physically challenging class that is infused with creative sequencing and teachings from Western Psychology and yoga philosophy. This class will focus on postures to help relieve overall emotional and physical tension, translating into a restful night of sleep. Recommended Props: Block, Bolster, Blanket. Dial down the stress and nurture the relaxation response (e.g., parasympathetic nervous system), where we can learn to soften and relax, stepping into a place of surrender and less reaction. Recommended Props: 2 Blocks, Bolster, Blanket. While this class is designed for all 3 trimesters, it focuses on addressing common symptoms associated with the 3rd trimester, including edema, leg pain, and fatigue. Props: blanket, 2 blocks, bolster.